During these hot humid Southern summer days, my thoughts drifted to the times of cold weather, fir trees covered with colors and lights, snowflakes graciously dancing in the skies… Yes, I was dreaming about White Christmas. I decided to follow my dreams and make a Christmas doll. How about Santa? I haven’t ever made one, but, hey, it is never too late! But on the other hand, show me any doll-maker who hasn’t made a Santa doll, preparing for Christmas! How many Santas do collectors want? Tortured between “Why should I?” and “I want it!”, I decided that a Russian style Santa is a good compromise. But I must tell you upfront that Russian style Santa or Father Frost is almost nothing like American Santa Claus! To be accurate, the real name of this Russian folk character is Grandfather Frost. He is really-really old, but very strong and powerful – he can freeze anything with a touch of his magic icy rod. It is he who puts the snow blanket all over the land. It is he who is the lord and master of blizzards, snowstorms, and freezing winds. Russians always respected him and were afraid to make him angry. That’s why for centuries it was Grandfather Frost who received all the presents or “bribes”. Only in late 19th – early 20th century did Grandfather Frost become softer and started bringing presents to well-behaved children. Personally, I think, it was his granddaughter – Snegurochka – Snow Maiden – who melted the old man’s heart and turned him into a kind and generous person. How he got a granddaughter is a mystery. Nobody heard about Grandfather Frost being ever married or having children. One legend says that Grandfather Frost has a daughter – beautiful and the ever-young Lady Spring. Snow Maiden was her daughter. Apparently, the Snow Maiden not only inherited the cold nature of her grandfather but also the kindness of her mother Spring. Nevertheless, Grandfather Frost had the full custody of the child… (My understanding). 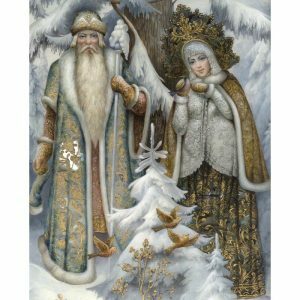 Since late 19th century, the Snow Maiden has always accompanied her grandfather during winter holidays, helping him bring presents to children. So, back to Grandfather Frost… I am going to sculpt his face first. In my next note, I will explain the main differences between Grandfather Frost and Santa Claus.